March 24, 1913 marked the opening of the International Exhibition of Modern Art at its second stop and its only museum venue, the Art Institute of Chicago. Director William M.R. French wasn’t enthusiastic about the controversial avant-garde works in the New York show, but he recognized their importance. He asked for a scaled-down version of the exhibition that focused on European works, and only one by most of the American painters (and none of the sculptors), since many were already represented in their collection. 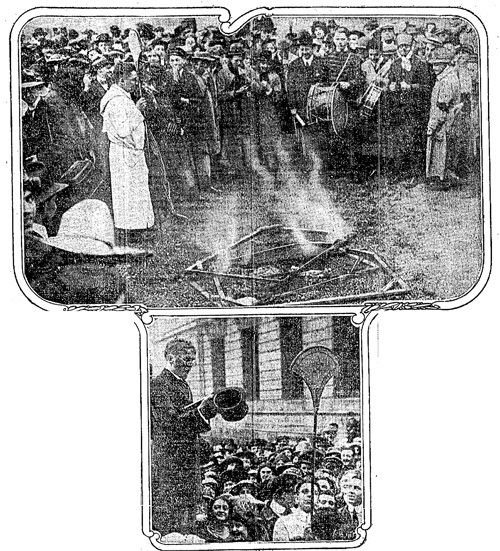 After initially condemning Chicago, Kuhn saw more and more thoughtful reactions to show as it progressed, and by the end he temporized (in spite of the art students’ bonfire), “The papers hammered the show, but it was a grand success.” As it had in New York, the Armory Show introduced the Chicago public to European modernism. For more on the Chicago venue, see the Art Institute’s online exhibition.